Lean ground beef is so expensive these days. Even on sale I find it difficult to get 93% lean for less than $3.99 a lb and normally it is $4.99 a pound or more. My I often see much fattier beef for considerably less. In fact, my local ethnic markets has in on sale once a month or so for as low at $1.09 a lb. But the problem is that this is so fatty. Sure you can drain it, but a lot of that fat is still left in there. So, I recently found out that you can actually rinse the ground beef to remove most of that fat (up to 50%!). And in the end it becomes almost as lean as the 93%. In the end you are getting lean ground beef to use for crumbles in chili, soup, tacos, etc.. for as much as 75% off the price. You do lose a small amount more of the meat when cooking than you do the 93%, put even with that, the savings is still really awesome. I was surprised by all this because I thought that a lot of the flavor would be lost, but it wasn’t, it tasted just fine. The only downside is that you can’t really season the meat as it is cooking. But I simply put it back in the pan after rinsing, add my seasoning and cooked it on low for a a couple minutes. Also see: How I Save At Least 50% on My Meat Budget. I was very pleased with it, not only does it reduce the fat, it reduces the price. Place a bowl under the strainer and press meat with the back of the spoon to push fat into bowl until no more or very little fat is dripping. I pour the oil out of the skillet into a heat safe mug or bowl and then dispose of once cool, you can also wipe out skillet, if desired. Add to your ground beef recipe. Thanks Beef Nutrition and Hilly Billy Housewife for all the details. Ive been rinsing my hamburger for years. The first time I heard of someone doing it, I thought it was really weird. But, after I thought about, it seemed like the sensible thing to do. I drive almost 80 miles to buy my meat. I buy all family packs, its cheaper that way. And I go on days that they have sales. O, I only go once a month, and buy in bulk. I put a cooler in the back and those hot/cold bags, for the trip. The selection is so much better there, then at any of the stores close to me (Theres only 3 to pick from in my town.) I always rinse my hamburger, and do it exactly like you said, above. I never have any complaints, well, not now. My husband thought it was really weird first time he saw me do it. Now he does it, too. That is pretty funny Mary! I too rinse my ground beef which I fry up with onions and peppers. I drain in a colander and save the water. I then put the water bowl in the frig overnight. The next a.m. You have a hard layer on top that you can easily lift off and dispose. Then I use the broth to make soups. There will be little crumbs of meat on the bottom, but that's ok. The butcher at our local grocery store told me that her packs marked with the fat content next up from lean, were the same as lean, but due to FDA standards, she couldn't mark it that way. So, I bought "higher fat content" pack, on sale & found it cooked up just the same. To cut down on the fat content you can also boil the hamburger meat. It can't be seasoned while cooking, but it doesn't affect the flavor once it is seasoned. Please do not feed your dogs this fat, unless you want to make them sick or possibly even kill them. Feeding dogs fat and fatty foods can very easily cause pancreatitis, which can kill them. If you feed the meat raw or a portion of meat that is cooked, as long as the fat content is relatively low it should not be a problem. Ask your vet, they will agree. Most of the fat is left in the pan. You scoop it out after cooked into the colander. So only a small amount is going down the drain. That may be true but over time you are risking clogging up your drains. I put my cooked ground beef in a paper towel covered paper plate to drain it. I have found that rinsing beef takes all the beef juices out of it and it tastes bland. Make sure you place the beef in a metal colander over a bowl and squeeze out as much fat as possible to avoid very much going down the drain when you rinse with hot water. The fat doesn't have to go down the drain. Simply place a dish under the strainer/colander to catch the fat. Then pour the fat into an empty soup can. Put it in the freezer and then toss. good tip! I do that too. I have done this for years and do the same thing with ground turkey. It is healthier and saves oodles of calories! How much? According to Dr Gourmet, 1 teaspoon of fat contains roughly 5 grams of fat and 50 calories. You can easily pour off 1/4 cup of fat from a pound of 80/20 ground beef saving a whopping 60 grams of fat and 600 calories. That is about 150 calories per serving. Now, doesn't it make even more sense? I have many Asian and Mexican markets in my area. They are VERY affordable. But you pay per pound for the fat also. Might as well get the less fat stuff. I figured the waste of the fat into the cost of the meat. It's still considerably less expensive. I found this post from the Frugal Friday Link Up Party. Hamburger meat is a staple in my house because of the flexibility it has for meal prep. I can brown up a good portion of hamburger and use it in several different meals through the week. I am gonna give this tip a try. I use all or 50% ground turkey in hamburger recipes that are strongly flavored (chili, etc.) Buy it very cheaply at Aldi. When I use hamburger, I brown the hamburger, I drain all the fat off I can, then rinse in the frying pan with just a little water. Pour off into a mug, and cool in refrigerator. The hardened fat can then be tossed in trash or used for DIY suet cakes. Please remember to use hot water when you rinse.I find it is best to get the water hot before you even start. Weight Watchers had instructions for doing this way back when. It actually works the best if you put the meat in a heat proof colander and pour boiling water from a kettle over it to rinse and then run a lot of hot water down the drain. I've never had a problem with the drain backing up (I don't know about septic systems, though). That method removes the most fat from what WW said. You could do this over a stock pot and pour the fat and water over dry dog food. We have Pyrenees dogs, and they love the treat. Save your pipes and make the dog's food more palatable! Also, I boil a 5lb chub of hamburger in the crockpot WITH seasonings until it is well done, then pour off the liquid and cool in the fridge to harden the fat. Lift off the disc of fat and you have beef stock! It is very flavorful. Wow! I want to come shop at your stores!!! In my area, ground beef prices have risen so much that the 30/70 is $3.99+ per pound! I'd LOVE to find it for $1.09/lb...that is crazy! I know.. most places it is in my area, too. Try to look for Mexican or Asian Grocery food stores in your area and follow their ads. You might fight a few deals there! I use to work in the meat dept. so I like to buy lean shoulder, chuck, round or sirloin tip roasts on sale $1.99-2.49lb and grind my own ground round at home. You can even ask the butcher to grind them for you! Nice savings! I mix together several things to make my "stretcher" meat mixture." 10# of cheapest hamburger, 5# of cheapest ground turkey, 5# of ground pork, 2# ground pork sausage, 1 onion, minced, 1 tbs salt, 1 tsp pepper, 2-4 c. grated zucchini, 4 eggs, 4 c. quick oatmeal, 1-2 c. milk, 2 cans refried beans(opt). Mix with your hands in large dishpan until thoroughly blended. Package in pint freezer bags, 2 c to a bag. Can be used for any recipe calling for hamburger or even grilled as is. I've cut down my meat useage over the years to 1/2# for casseroles so this recipe goes a LONG ways without compromising flavor! Also makes a great meatloaf! That is a WONDERFUL idea. It also sounds a lot like my meatloaf recipe, so I know I would like it! I have done this before. I am more concerned about what is in the cheaper meat- the pink slime etc... I usually grind my own from roasts etc... I put in the amount of fat I want and cut the rest off. I'm sure you are saving $$ but not as much as you think because you have paid "by the pound" for the fat you're removing so that increases the "per pound" price for what you have left. I've been doing this for years. We used to own a meat packing plant and my husband is the meat manager at a well known grocery store. I rinse the meat with hot water to get as much fat off as possible. Cold water will cause the fat to harden and you don't really get it all. I also add about a teaspoon of ground flax to give a bit of oily content and flavour, (too dry and it tastes like paper). Can't taste the flax and it adds lots of omega 3. Spice as desired. I heard of something called "Whack a meal" in one of my books. They would brown up a big bunch of hamburger, then put it in a freezer ziplocks in a very flat, thin layer. You could even stack them to save space. Then when you are ready to use your hamburger, you just take the ziplock of frozen meat, whack it gently on the counter and add it directly to your recipe. It thaws almost immediately as you cook it. I keep meaning to try this. If you are doing this to get rid of the fat, then great! But if you are doing it to save $$ by buying a cheaper hamburg it's not working. You paid by the pound for the fat you wash off which means you paid a higher price per pound for the meat that's left. No $$ saved. Please! Read her whole post. She compares all that. Just buy round steak or sirloin steak (both are lean cuts) when it is on sale and trim any visible fat off .... cut in to 1" chunks and pulse it in your blender or food processor until it is ground to the texture you desire. Best burgers ever! You will be surprised to see how little fat there is when cooking. It's like when they ground beef, they don't trim the fat off very well, thus more weight/lb equals money in their pocket! When you grind your own beef, you know exactly what is in it. I make a mixture. First I saute chopped onions 1/4 the amount of the ground beef, then I cook the ground beef up and throw them in there, cooking the last few minutes with 1/4 cup steel cut oats to 1 lb ground beef and some extra water garlic and seasonings and finally I throw in the same volume of cooked beans as the beef and I put this in most things I would use ground beef in things like Mexican food and Shepard's pie. This stretches it quite a bit and I end up with a healthier mix. I made sloppy Joe's yesterday with half carrots, onions, celery diced finely in my food processor (though bell peppers would have been better if I had them) and half ground beef, It really was all about getting my kids to eat more veggies. It totally worked, they declared that they were the best sloppy Joe's they had ever had and I didn't let them know they were eating vegetables. 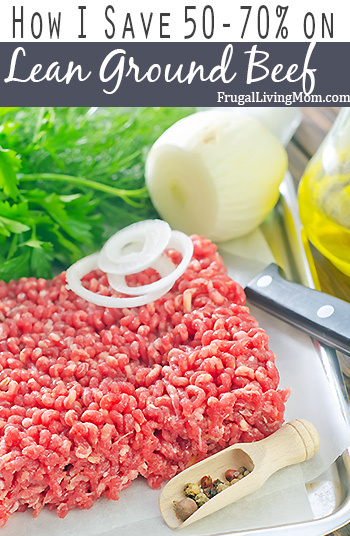 It's a good tipo; i hace one that i discovered as a newlywed mom of three housewife: i purchase lean ground beef and use only 1/4 of the packet con each recipe for 4 servings! If you're making hamburgers or meatbals por even a meatloaf try this: Mix ground beef with half the amount of oatmeal (i use the one minute kind), add an egg and season as usual. Never fails! You can't tell there's oatmeal in it, and there's even less reduction... Plus: it's healthier!!! I'm nervous about buying meat at our ethnic markets -- they just don't seem to be as clean as the regular supermarkets. Have you ever found quality to be an issue? Personally, I have not. But I would think it would vary. We don't a eat a lot of ground meat ourselves, but I make dog food with it and it gets pretty pricey if I can't find it on sale. We go through three pounds in just under a week. This is an awesome idea! Thanks!